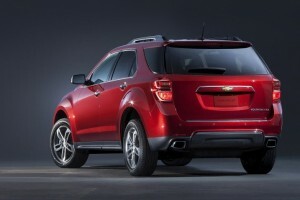 Want to learn more about the 2016 Chevy Equinox? Read the expert review from Edmunds.com. For 2016, the Chevrolet Equinox receives revised front-end styling with projector-beam headlights, LED daytime running lights (LT and LTZ) and an updated rear fascia with new taillights. Upgraded cloth upholstery and a 7-inch touchscreen with a rearview camera are now standard on the base L and LS trims, while the dashboard gets a new storage shelf and updated control graphics. Additionally, a blind-spot monitor with rear cross-traffic alert is now available on LT and LTZ. With a number of well-rounded rivals nipping at its heels, the 2016 Chevrolet Equinox gets a welcome rejuvenation. This aging crossover still has plenty of life, and Chevrolet has improved its features in some key areas. A touchscreen interface, for example, is increasingly expected by shoppers in this segment, and the 2016 Equinox checks that box with its newly standard 7-inch interface. Also expected are available items like LED exterior lighting and blind-spot monitoring, and here again, the refreshed Equinox delivers. A lingering sore spot is the base four-cylinder engine, which receives solid EPA fuel economy estimates but has a hard time matching them in the real world. We’re also underwhelmed by the base four’s acceleration compared to other fours in this class. If you’re looking for extra power, though, the Equinox provides it in the form of a segment-topping 301-horsepower V6 that’s optional on more expensive models. No matter which model you choose, you’ll enjoy a big backseat that slides and reclines, as well as a ride that’s smooth and quiet relative to other reasonably priced crossovers. Although the 2016 Equinox’s improvements are meaningful, this segment is chock full of appealing entrants. The multitalented Honda CR-V provides better fuel economy and more maximum cargo space, while the Ford Escapeand Mazda CX-5 also serve up superior agility. The engaging and roomy Hyundai Santa Fe Sport delivers value that’s hard to beat, and the versatile Jeep Cherokee has an available V6 of its own and some serious off-roading chops when properly equipped. But the Equinox remains a very pleasant crossover to drive, and the tweaks for 2016 should only enhance its appeal. If you’re looking for a practical two-row crossover at an attainable price, the re-energized 2016 Equinox is worth considering closely. The 2016 Chevrolet Equinox is a compact crossover SUV that’s offered in four trim levels: L, LS, LT and LTZ. Standard equipment on the entry-level L includes 17-inch alloy wheels, automatic headlights, air-conditioning, premium cloth upholstery, a partial power driver seat with power height and lumbar adjustments, a 60/40-split second-row seat that slides and reclines, cruise control, a trip computer and a tilt-and-telescoping steering wheel. 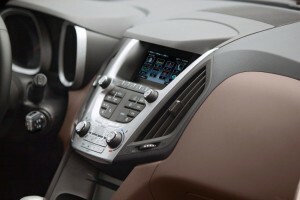 In terms of onboard technology, the Equinox L comes standard with Bluetooth phone (but not audio) connectivity, OnStar communications (with an in-car 4G WiFi hotspot), a 7-inch touchscreen interface, a rearview camera and a six-speaker sound system with an auxiliary audio input jack and a USB port. The Equinox LS is very similar but has a few extra features, most notably satellite radio, a compass and an available towing package that’s also optional on LT and LTZ. The LT adds different 17-inch wheels, LED daytime running lights, heated mirrors, rear privacy glass, roof rack side rails and an upgraded audio system that includes Chevy’s MyLink interface, Bluetooth audio connectivity, voice controls and smartphone integration for Internet radio apps (Pandora and Stitcher). At the top of the line, there’s the LTZ, which further adds 18-inch alloy wheels, foglights, unique exterior trim with chrome accents, remote start, rear parking sensors, leather upholstery, a leather-wrapped steering wheel, an eight-way power driver seat, heated front seats, driver memory settings, an auto-dimming rearview mirror and automatic climate control. LTZ models equipped with the V6 engine also get firmer suspension tuning. The LT’s optional Convenience package adds a number of the LTZ’s standard features (remote start, automatic climate control, leather-wrapped steering wheel, heated seats). Ordering it also unlocks the separate options of a power liftgate and 18-inch chrome-clad wheels. Optional on both the LT and LTZ are a sunroof, a Driver Confidence package (adds rear parking sensors and a blind-spot monitor with rear cross-traffic alert) and a Technology Package (adds a navigation system and an eight-speaker Pioneer audio system). Optional on the LTZ only is a Driver Confidence II package (adds lane-departure warning and forward collision alert) and an Enhanced Convenience package (adds the power liftgate and an eight-way power front passenger seat). 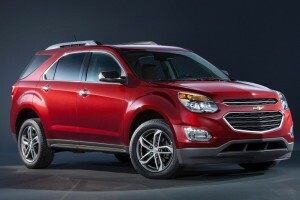 The 2016 Chevrolet Equinox’s standard engine is a 2.4-liter four-cylinder. A 3.6-liter V6 is optional on LT and LTZ. Both engines come with a six-speed automatic transmission and are available with front- or all-wheel drive. The 2.4-liter four-cylinder puts out 182 hp and 172 pound-feet of torque. In Edmunds testing, a front-wheel-drive Equinox with the four-cylinder engine accelerated from zero to 60 mph in 9.8 seconds, which is a little slower than average for this segment. The EPA projects 26 mpg combined (22 city/32 highway) with front-wheel drive and 23 mpg combined (20/29) with all-wheel drive. While these numbers are respectable, we’ve had a hard time reproducing them in the real world, especially on the highway. The 3.6-liter V6 comes with dual exhaust tips and produces a healthy 301 hp and 272 lb-ft of torque. In testing of the essentially identical GMC Terrain with the V6 and all-wheel drive, we recorded a 0-60 time of 7.0 seconds. That’s impressive, as it’s about half a second quicker than average for small and midsize crossovers with an upgraded engine. There’s a price at the pump, though, as EPA fuel economy estimates drop to 20 mpg combined(17/24) with FWD and 18 mpg combined (16/23) with AWD. Properly equipped, four-cylinder models will tow up to 1,500 pounds, while the V6 towing capacity climbs to a handy 3,500 pounds. 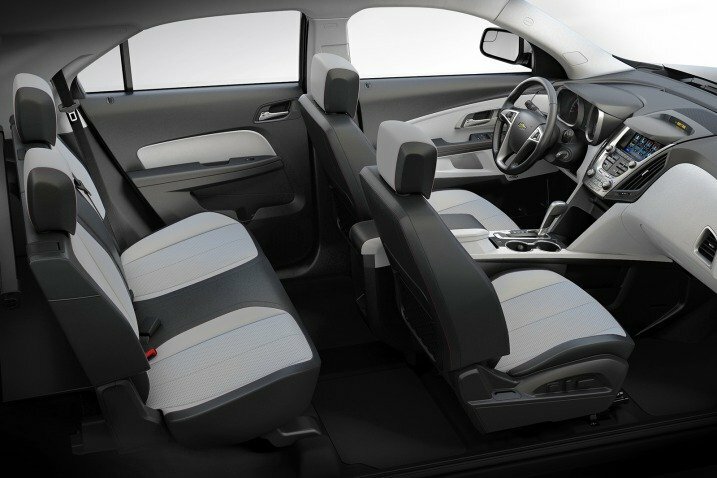 Standard safety features on the 2016 Chevy Equinox include antilock disc brakes, traction and stability control, front seat side-impact airbags and side curtain airbags. Also standard are a rearview camera and GM’s OnStar emergency communications system, which includes automatic crash notification, an emergency assistance button, remote door unlock and stolen vehicle assistance. Optional on the LT and LTZ are rear parking sensors and a blind-spot monitor with rear cross-traffic alert, while the LTZ can also be outfitted with forward collision alert and a lane departure warning system. In government crash tests, the Equinox received an overall score of four stars out of a possible five, with four stars for frontal crash protection and five stars for side protection. In testing by the Insurance Institute for Highway Safety, the Equinox earned the highest possible rating of “Good” in the small-overlap frontal-offset, moderate-overlap frontal offset, side impact and roof strength tests. Its head and seat restraint design was also rated “Good” for whiplash protection in rear impacts. The 2016 Equinox’s dashboard is sleek and stylish. As with most current Chevy models, the dash contours flow smoothly into the door panels, creating a wraparound feel that’s distinctive in this segment. The quality of the materials is unremarkable, but the overall effect is nonetheless quite pleasing. Although the small buttons on the center stack can be hard to differentiate at a glance, the Equinox’s controls are generally well laid-out and easily learned. The standard 7-inch touchscreen interface features customizable menus similar to those on modern smartphones, and it’s relatively easy to use. The available MyLink interface incorporates Bluetooth streaming audio capability and compatibility with popular smartphone apps. There are a few weak spots, though, such as the touchscreen’s occasionally slow processing times and missed responses to touch inputs. The lack of standard Bluetooth audio (unavailable on L and LS trims) is also lamentable. Seating comfort is good all around, with particular credit due to the luxuriously roomy backseat, which features slide-and-recline functions for added versatility. The downside to this copious passenger space is that the Equinox offers less cargo space than many competitors, with 31.5 cubic feet of storage behind the 60/40-split rear seats and a maximum of 63.7 cubes with those seatbacks folded down. That’s still an ample cargo bay, but it trails rivals like the CR-V, which can accommodate more than 70 cubes. Driving characteristics for the 2016 Chevrolet Equinox will depend in significant part on which engine you select. The four-cylinder Equinox may have similar output ratings to the base engines in other compact crossovers, but it doesn’t feel as potent on the road. You’ll have the gas pedal floored during routine merging and passing maneuvers, which is neither reassuring nor fuel-efficient. If you’re looking for a more enjoyable driving experience, the V6 is definitely the way to go. With 301 horses on tap, it’s one of the most capable engines in any crossover in this price range. The Equinox’s handling abilities are nothing special. The steering feels numb and somewhat imprecise, while the suspension is tuned to favor comfort over athleticism. The upside, of course, is an isolated, smooth ride that’s enhanced by the quietness of the cabin at speed.